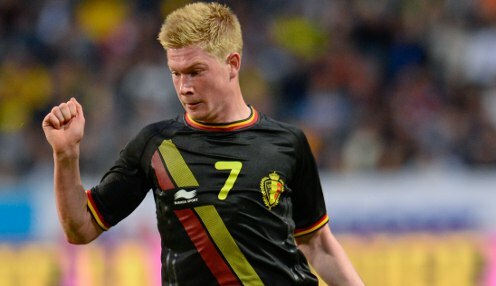 DFB-Pokal winners and Bundesliga runners-up Wolfsburg are determined to try and keep star forward Kevin de Bruyne at the club for next season. The 23-year-old former Chelsea man has been heavily linked with a number of top clubs across Europe, but his current employers are keen to keep him at the Volkswagen Arena, as they prepare for a massive season for the club. Chairman Francisco Javier Garcia Sanz told Sport Bild magazine: "We want to confirm our success this season in the future and, for that, we are keeping this team together." De Bruyne was recently non-committal about his future plans, having re-energised his career since joining Wolfsburg in January 2014 after an unsuccessful stint at Stamford Bridge. He told Bild: "If Bayern are interested then they should get in touch with Wolfsburg, they will make the decision as they are responsible for my future. "All I know about interested clubs is from reading newspapers. I have not spoken with any clubs as of now. However, I cannot say I'm definitely going to stay here this summer. "I think fans are better treated when players are honest with them, rather than for me to swear my eternal love to Wolfsburg then disappear. "I know that I like the Bundesliga and it always did me good, but I don't fear returning to England, or playing in Spain. I believe I can make it there." Meanwhile, Germany can be backed at 1/1 to triumph at Euro 2016 in France, with Die Mannschaft 12121/1 to retain their World Cup crown in Russia in 2018. Don't forget, all Bundesliga matches are covered by the bet365 Euro Soccer Bonus, where you could earn a bonus of up to 100% on your returns on pre-match accumulator bets. T & Cs apply.